Let's face it. There are not a lot of options for Dim Sum in New West. I mean, it ain't the hotbed of Chinese food in general. Sure, there is Kirin out at the Starlight Casino; but that is not exactly close to the heart of the Royal City. 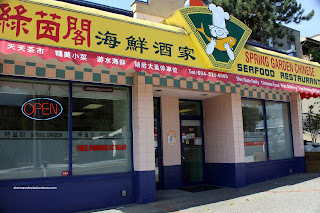 Dragon Palace is barely acceptable and there is New Lakeview; yet that is technically still Burnaby. And on the topic of Burnaby, there is Po King. But I'd rather not eat at all than to suffer the abuse from the owner-lady there. 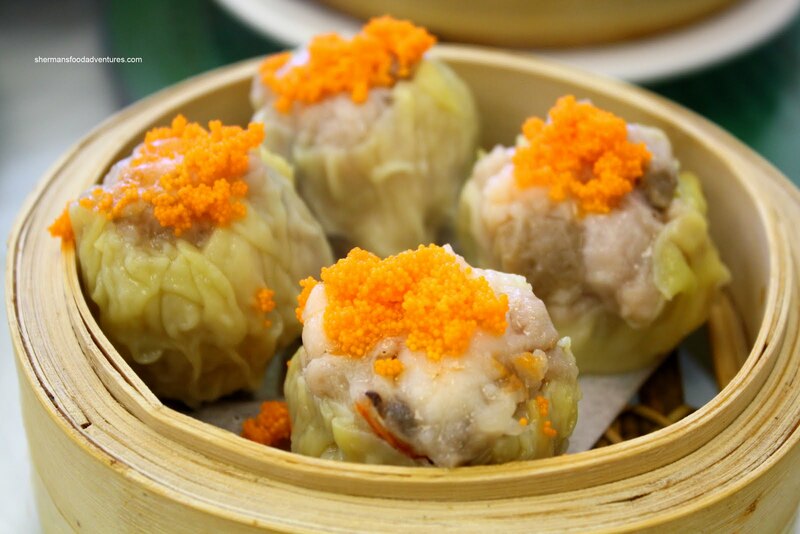 Alas, there is another place for Dim Sum out on 12th. Karl and Jenny gave it the thumbs up and that meant it was time for a visit. One really attractive feature of Spring Garden has nothing to do with the food itself. Instead, there is a fairly large parking lot at the back. It saves you time looking for a space and saving some quarters in the process. Walking into the place, we noticed that it was quite small. Definitely a mom & pop operation. When done right, these places have a certain charm to them. It is the type of place where you can expect sincere service and honest food. Of course, that is in theory. So we did get friendly service and they even asked about our kids. You don't get that at a "corporate" type establishment. Since we were here on a weekday morning, the place was really quiet. Kinda nice to have a relaxing Dim Sum for once. Often, it seems like Dim Sum translates into a 1.5 hour fire drill. As for the Dim Sum, it is your typical checklist order sheet. As usual, we ordered too much. Darn that checklist! Anyways, we started with the Shrimp Dumplings. On the plus side, they were large and filled with lots of whole pieces of shrimp with "snap" (I'm using this description from now on, it makes more sense than "crunchy"). However, the dumpling wrapper was woefully overcooked and too thick. The whole thing either fell apart or stuck to the neighbouring dumpling. 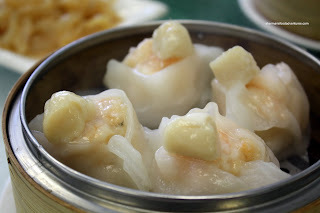 Suffering from the exact same problem were the Scallop and Shrimp Dumplings. The dumpling skin was a bit overwhelming and wet. We could not pick one up without epic failing. Despite this, the dumplings were big, the shrimp was good and there were 4 of them! Very unusual to get 4 of these at any place. The next standard Dim Sum item was the Sui Mai (Pork & Shrimp Dumpling). Looking like there was a sale on tobiko, these dumplings were on the chewier side. Not necessarily a bad thing since it is a whole lot better than mushy. There were too many big chunks of pork fat for my liking and the whole thing didn't have much flavour other than pork. We also got an order of the Marinated Jellyfish. The picture doesn't do it justice because the portion size was huge. This was actually quite good. The jellyfish was correctly prepared (being rinsed thoroughly) where it was "snappy" and devoid of fishy flavour. There was a good amount of sesame oil, chili flakes and only a hint of soy in the marinade. Something strange happened with the Rice Noodle Rolls (we got both shrimp and beef). When it arrived, we knew just by looking at it that they would be chewy and dense. Indeed the rice noodle was very subpar. Stiff, thick and completely opposite of what makes this dish yummy, we were not enjoying it. At least the shrimp was good and there was plenty of beef. Now, this is where the strange part comes in. 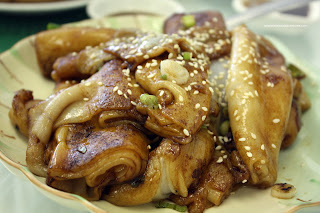 We also ordered a plate of Pan-Fried Rice Noodle Rolls. 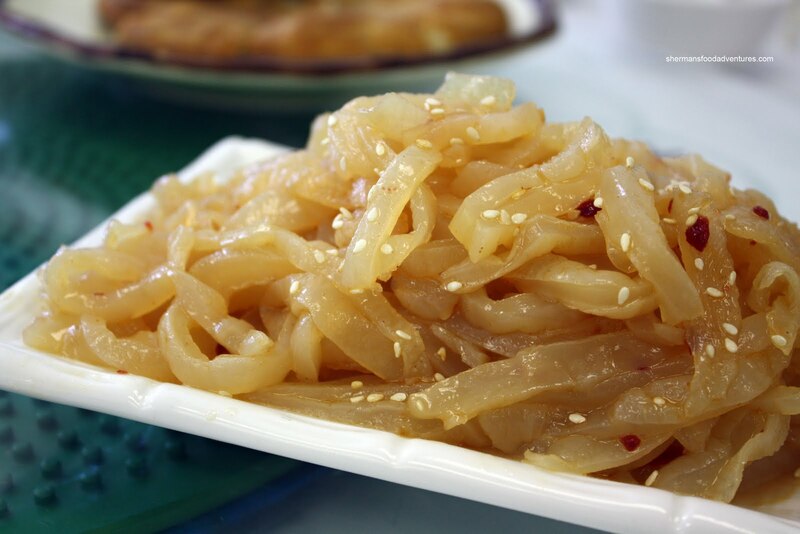 With this version, the rice noodles were fantastic! 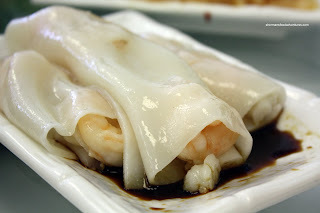 Even though they came in really large rolled sections, the rice noodle was fluffy and extremely soft. How can the same product be so different? Separate batches? Different cooking method? Fluke? We had no idea. Truthfully, the cooking method shouldn't matter. We asked the server and she said all of the rice noodle rolls are freshly made. We believe her since it would not make much sense for a small operation to make a whole bunch and risk not selling them. But that didn't solve the mystery of the good rice noodle roll and bad rice noodle roll. For some reason or another, we got an order of the Chicken Feet (or Phoenix Talons). 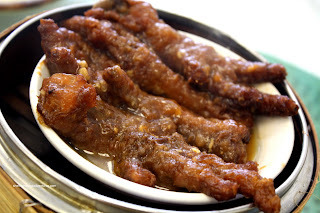 Nothing particularly unusual about that (well, unless you don't eat chicken feet), other than we didn't order it. I just assumed Viv had checked it off on the list. Apparently they messed up and gave us someone elses' chicken feet. It would've served us better if we didn't get it. It didn't seem very fresh and was quite soft. Furthermore, there was this stale-type flavour to it. 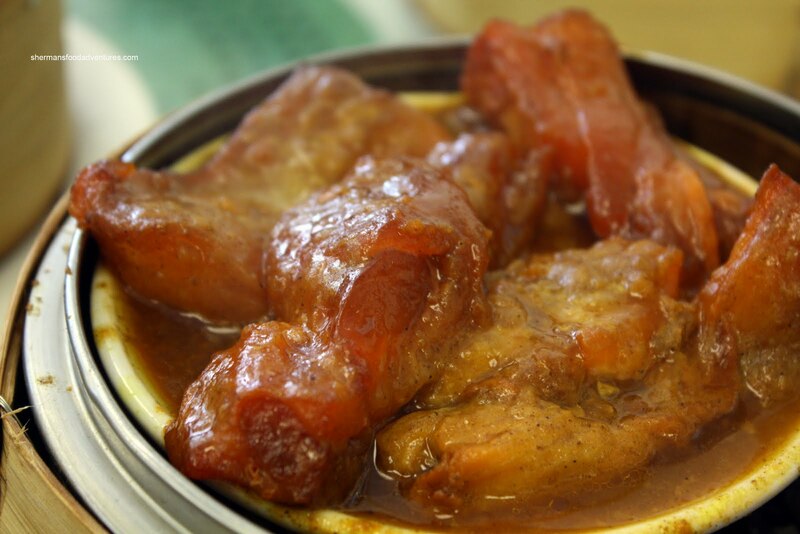 This same flavour also applied to the Curry Beef Tendons. In fact, we didn't even taste much curry. Once again, it had the same stale-type flavour to it. The tendons were very soft and some were bordering on melting. I'm not going to go as far as saying that these dishes were re-steamed; but they sure seemed like it. I don't blame the restaurant for doing so since it is a small operation; yet the end result was a weak product. Now for a really good dish, the Green Onion Pancake. Fried until it was extremely crispy, the pancake was crisp on the outside (without being oil-logged). 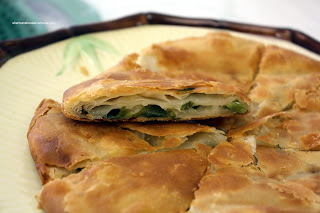 Inside, there was a good amount of green onion within the many soft fluffy layers. I'm not a huge fan of green onion; but I did like it here. And that's saying a lot. Now if you think that I didn't enjoy my meal at here; I don't blame you. After all, most of the dishes were pretty average at best. However, I realize that this is New West and furthermore; the prices are very reasonable. Thus, we have to use a different baseline to compare the food to. 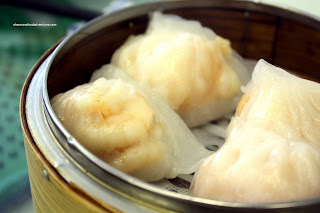 With that being said, I had Dim Sum in Langley at Luxe and it was better than this. Take it for what it is and it's okay. Compare it to better and more expensive places, Spring Garden will not be able to measure up. Hi Jenny, it's surprising that Luxe is so good isn't it? I almost couldn't believe it!